In Part 1 of our Bakfiets Buying Guide, we gave general tips for buying a new front-loading cargo bike. Part 2 of this series highlights some popular models along with their plus and minus points. After this article read Part 3, featuring alternative setups for family bike transport. 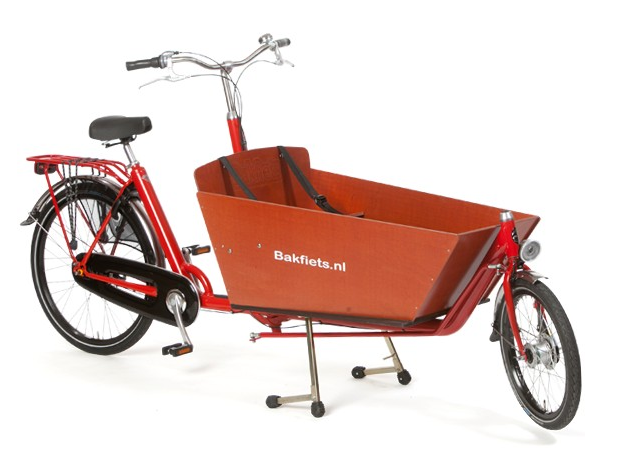 The CargoBike Long from Bakfiets.nl is one of the best on the market. The CargoBike Long took first place in the 2013 Fietsersbond Bakfiets test — a study done by the Dutch cyclists’ union. Expect to pay about €1,700 for a 7-speed version. The bike is Dutch-made and the brand is one of the best respected in the Netherlands. The wheels, paint finish and material used for the front basket are all of a high quality, which means you can easily store this bike on the street, in the rain and the wind, and it will still ride well. The kickstand is also easy to use and the bike is available in a range of colours, with many different accessories. It’s hard to find a new bakfiets for under €1,000 so based on that measure alone the Babboe City is worth a look. In addition to the attractive ticket price, it has a roomy front basket and a sleek appearance. On the downside, we believe the low price also means that some of the materials aren’t as durable or efficient as those used on other bikes. The front basket, for example, is made of pressed beech wood rather than the betonplex used for higher quality bikes. This makes it more vulnerable to rain and damp. The Fietsersbond pointed out that the Babboe City’s kickstand can be hard to knock into place when you need to park the bike. We’re not saying don’t get a Babboe City bike (though some would go so far). We’re simply pointing out that ‘bargain’ bikes like the Babboe line may not last as long and could require more maintenance in the long run, especially if the bike is stored outside in the wind and rain. Gazelle’s Cabby bakfiets has a foldable front basket, which makes storage and parking easier. Gazelle’s Cabby is a bit different from most of its competitors. The front box is made of vinyl and can be folded or even removed entirely to save space. This is arguably handy if you have limited storage space or want to park it on a narrow sidewalk. On the downside, the Fietserbond found the Cabby didn’t ride as nicely as other bakfiets models. They also marked it down for a poorly designed kickstand and the fact that there’s no step to help kids climb into the front basket. Many reviews also mention the fact that the gearing isn’t low enough to allow you to easily get up a steep hill and the brakes can also be a little weak coming down hills. For anyone living in the Netherlands, this may never be an issue unless you live in the “mountainous” south of the country. 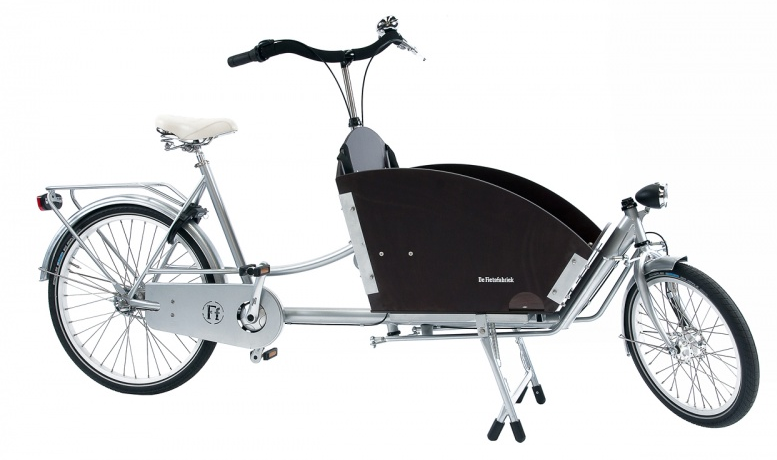 Urban Arrow’s Family bakfiets is one of the top-rated electric cargo bikes. 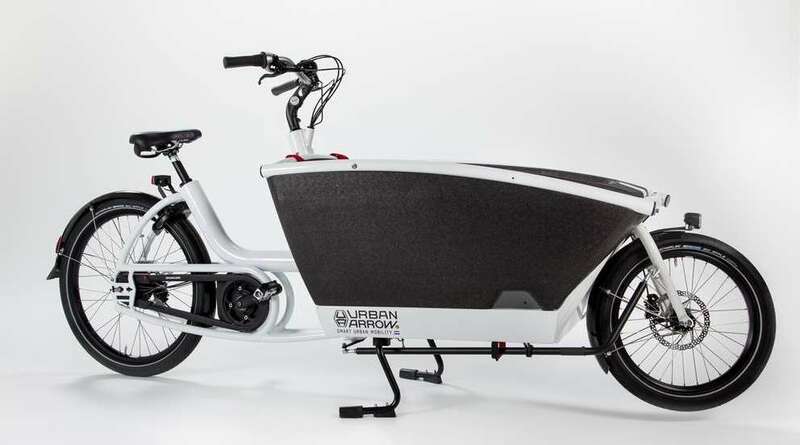 The Urban Arrow Family is a top model among electric bakfietsen. At about €3,500 it’s not cheap but for the price you get a light aluminium frame, a front basket big enough to carry 4 kids, a stable ride and support from a strong motor which will have you flying along the bike paths. Many reviews have named it the best electric bakfiets on the market. On the downside, it’s fairly big and this can make it tricky to park and turn around. The dark colour of the bak can also make it warm on a hot summer’s day. 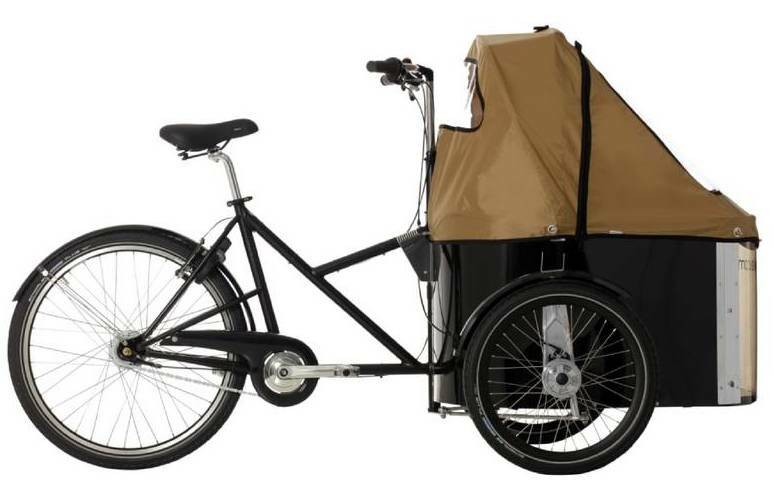 The Danish-made Nihola brand of cargo bikes is very well respected. It’s not only the Dutch who make cargo bikes. The Danish are also enthusiastic cyclists and Nihola is one of their most respected cargo bike brands. Their most popular model is the three-wheeled Nihola Family, with space for a couple kids on the front bench. Nihola also make bigger versions with enough room for up to 4 kids or easy access for the family dog. Since this is a three-wheeled bike, you don’t have to worry about stability quite as much, though if you put too much weight in the front of any trike there’s always a risk it will tip on its nose! The basic model holds 2 kids (3 at a squeeze) and is pleasingly compact. If you only need to carry a couple kids and a little shopping, the Fietsfabriek original bakfiets is smaller than many others and this definitely has an appeal on crowded city bike paths and when trying to park. It’s also built by a company with a reputation for using good quality materials. This bike has one quirk: the brakes are an odd combination of a back-pedal (coaster) brake in the back and drum brakes in the front. In their test, the Dutch cyclist’s union said this was illogical because it prevents you from rolling the pedals backwards at a stoplight in order to get into a good, powerful starting position. Ideally, you want to be able to back pedal when stopped until the pedal is at 2 o’clock position, forward and high. 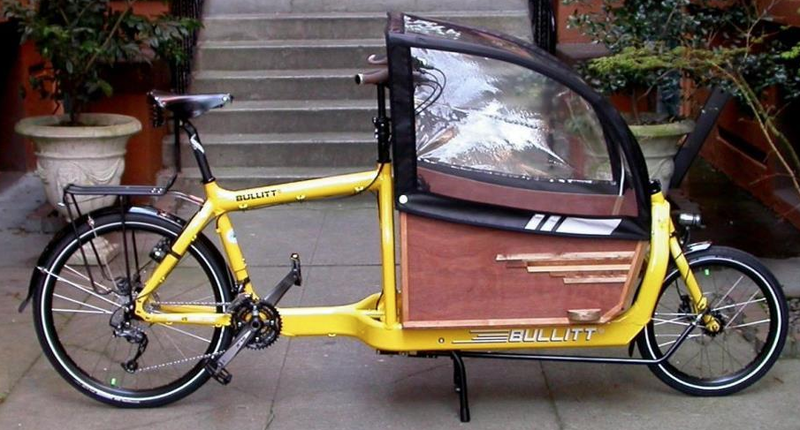 The Bullitt Bike built up as a capable kid carrier. Image by Splendid Cycles. Looking for a fast bakfiets? The Bullitt bike could be right up your street. It was invented by a keen Danish racing cyclist who couldn’t bear the thought of swapping from his race bike to a traditional bakfiets when his kids were born. He likened the switch as equivalent to going from a racing car to a tractor and that’s why he invented the Bullitt bike. 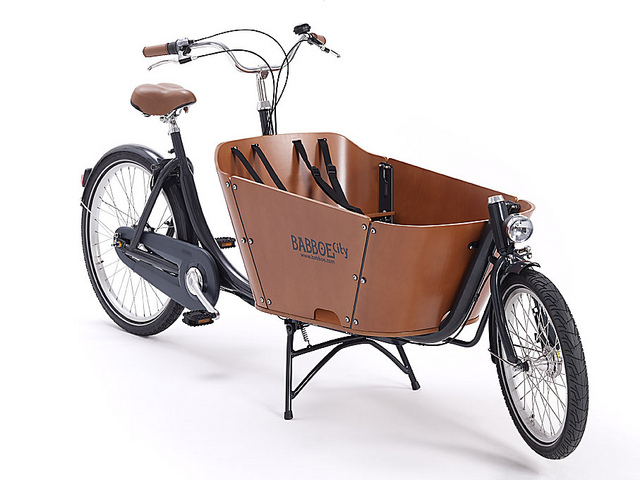 It comes in a ton of colours and options, can be easily built up to carry 2-3 kids and is a favourite of Chris, the owner of the respected Beerfietsen bike shop in The Hague. For an enthusiastic review of the bike as a cargo and kid carrier, see the Totcycle website. Some people find the handling of the Bullitt bike takes a little getting used to but generally after a couple days of riding it around town they seem to adjust and love it. The Zigo leader is not only a bicycle. The front “cab” separates so that you can use it as a stroller in town. 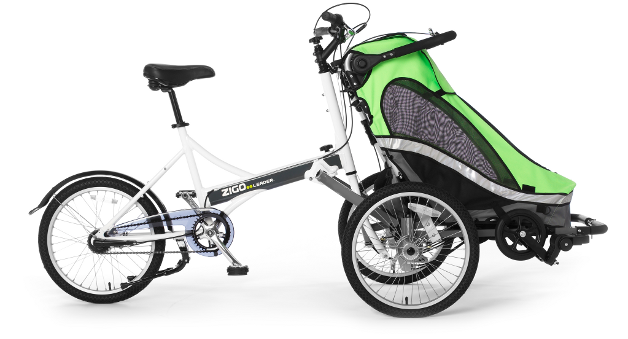 Full disclosure: we’ve only seen this bike occasionally zipping down bike paths, so we can’t speak about the Zigo Leader from first hand experience but we love the concept of a bike that can carry two kids and is not only a bike but also a stroller and a jogger (with the purchase of a separate accessory). This really is a cargo bike that tries to do it all. Many love it. Others have found it heavy and were put off by its wide turning radius. At this point, we’re going to stop our list. These are the bikes that most attract our attention but there are tons of other bakfiets brands out there (the Danish Christiania, the super stylish Johnny Loco, the modern Dolly Bike). We suggest you do some research online and then visit a few shops to test models out in person and see which suits you best. Where to go? Beerfietsen in The Hague is our top choice for knowledgable, friendly service. They also allow you to rent bikes for a weekend and if you buy a bike from them, you can take the rental cost off the purchase price. Also worth a visit are Juizz in The Hague, Amsterdam and Utrecht (they specialise in electric bikes) and WorkCycles in Amsterdam. Until 2014, WorkCycles sold their own branded and upgraded version of the Bakfiets.nl bikes and recently they introduced their own KR8 Bakfiets. If you want to buy second hand, then Marktplaats is your best bet but you’ll need a little luck. Used cargo bikes are quickly sold and bidding can be intense. Also, you’re best off looking for one in your area so that you can easily bike it back home. Otherwise you’ll have a heck of a time trying to fit it into most family cars (you might need to hire a moving van or trailer) and you can’t take a bakfiets on the train. For more thoughts on buying a bakfiets, see this handy writeup by The Hague Housewife. It’s not one I’ve seen a lot. Do you have an experience with it that you’d like to share? You should add the Workcycles Kr8 (by far the best value and most durable of the lot) to your review.